SCHEDULE: This programme is run in accordance with demand and can be held with a minimum of three participants. … a premiere-class, one-day (2 x half-days) business SEO Training programme that focuses exclusively on your website’s organic search footprint. The course is run over two half-days. The minimum participant number is two and the maximum than can be accommodated is 8 participants. Register your interest for the next programme or one-to-one mentoring by calling 01-2360076. How many participants from my company may attend? There is no upper limit, however, please note that the registration fee is per participant. A discount may be agreed for two or more participants – please call 01-2360076. The course is designed for business owners, marketing management and senior marketing staff to help them set direction, execute and manage their company’s on-going SEO initiative. Although IT staff may attend, technical knowledge is not a pre-requisite. Understand what SEO strategy is, how to choose the most vable SEO strategy for your particular business and how to competitively differentiate in your organic search activities. Research and analyse your online persona targets, identify their search behaviours and tap into these behaviours in a way that generates new business leads or online sales. Understand the new rules of semantic search and what it takes to align Google’s interpretation of a searcher’s true search intent to your website’s content and its distribution. Learn how to conduct an SEO competitor analysis that will help you to identify effective search strategies and potential inbound link targets on an on-going basis as you build authority for your website. Learn how to structure your website in a way that builds the content authority you need to be considered as a credible organic search result. Learn the core methods used in SEO to build “link authority” from within your targeted community and avoiding the pitfalls of artificial, penalty-inducing link infrastructure. Learn the “process” of SEO – the steps you need to take to get early traction on Google and the steps needed for a longer term organic presence on all major search engines. Learn how to optimise rich media such a video, images and other documents what can be extremely valuable independent sources of visitor traffic for your website. If you are exporting (please specify this at time of booking as this will significantly impact the time allocation of individual course modules), you will learn how to target search traffic in foreigh markets and how to tap into Google’s preference for presenting local search results on national listings. Learn what “content marketing” is and how SEO can significantly build the value of your digital assets. Learn how to report on SEO effectiveness, what traditional reporting looks like and how the semantic internet is changing the very definition of SEO key performance indicators and hence its performance reporting. This programme is continually updated and is supported with several additional follow-on services if or as needed at additional cost. To schedule a one-to-one programme, please call 01-2360076. When you have completed the SEO Execution programme, you will have the knowledge to establish an SEO strategy, create an implementation plan and execute on it. As you do so, you will discover that whilst SEO was never going to be easy, there will always be bridges to cross or specific challenges to be addressed which cannot be anticipated in advance of execution. Several PraxisNow customers have found it extremely beneficial to join one of the 4-week SEO Practitioner groups as effectively a helping-hand, and indeed to acquire a more detailed understanding of some of the complex elements of SEO as they implement. If you would like to join one of these groups (cost: €1,500), let us know and we will prioritise a registration for you, i.e. your place on the next group will be guaranteed. Does it cover International SEO? Yes, but in overview form only. 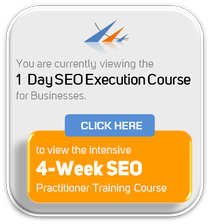 If you need to address international SEO at implementation level, you should consider the 4-week SEO Practitioner Training Course. Alternatively, if you would like to engage a one-to-one International SEO version of this programme, please contact us as a specific International version of the programme is available. Is this a Tailored Programme? No. This programme consists of existing PraxisNow training materials. If your training requirements extend beyond SEO, a special customised training agenda can be created for you. Please note however that additional costs will be incurred in this case.